The International Bureau serves as Registry for this Commission established pursuant to the Agreement of 12 December 2000 between the Government of the State of Eritrea and the Government of the Federal Democratic Republic of Ethiopia, with a mandate "to delimit and demarcate the colonial treaty border based on pertinent colonial treaties (1900, 1902 and 1908) and applicable international law". Its first progress report to the UN Secretary-General was presented on 19 June 2001. On 19 November 2003, the Commission met in The Hague with representatives of the parties. The President of the Commission made an opening statement expressing the concern of the Commission at the lack of progress in the demarcation process, setting out the Commission’s understanding of the positions of the parties and indicating that if progress was to be made, certain rigid positions would have to be modified. Following that meeting, the Commission concluded that, until the positions of either or both of the parties were modified, there was nothing more that the Commission could do. The Eritrea–Ethiopia Boundary Commission ruled that Badme lies in Eritrea. The Eritrea–Ethiopia Claims Commission (the Commission) was established and operates pursuant to Article 5 of the Agreement signed in Algiers on 12 December 2000 between the Governments of the State of Eritrea and the Federal Democratic Republic of Ethiopia (the "December Agreement"). The Commission is directed to decide through binding arbitration all claims for loss, damage or injury by one Government against the other, and by nationals (including both natural and juridical persons) of one party against the Government of the other party or entities owned or controlled by the other party that are (a) related to the conflict that was the subject of the Framework Agreement, the Modalities for its Implementation and the Cessation of Hostilities Agreement, and (b) result from violations of international humanitarian law, including the 1949 Geneva Conventions, or other violations of international law. ^ a b BBC staff (31 May 2000). "Ethiopia says 'war is over'". BBC. ^ a b c d Stephanie Busari and Schams Elwazer, "Former sworn enemies Ethiopia and Eritrea have declared end of war," CNN, July 9, 2018. Retrieved 9 July 2018. ^ a b c Abbink 2003, p. 221. ^ David Hamilton Shinn, Historical Dictionary of Ethiopia. The Scarecrow Press, inc.: Lanham, Maryland; Toronto; Oxford, 2004, pp. 387–8. ^ Fantahun, Arefaynie (7 June 2018). "Seare Mekonnen Named Ethiopian Military's Chief of Staff". Ethiopia Observer. Retrieved 6 August 2018. ^ Giorgis, Andebrhan Welde (2014). Eritrea at a Crossroads: A Narrative of Triumph, Betrayal and Hope. Strategic Book Publishing & Rights Agency, LLC. p. 526. ISBN 978-1628573312. Retrieved 7 August 2018. ^ Pike, John. "Ethiopia / Eritrea War". ^ a b Former U.S. Ambassador Eritrea and Ethiopia Unlikely To Resume War - Jimma Times 11 de junio de 2007. ^ Pike, John. "Ethiopia - Army". ^ "Eritrea reveals human cost of war". BBC News. 20 June 2001. Retrieved 2007-03-12. ^ Claimed by Chief of Staffs of ENDF, Tsadkan Gebre-Tensae. Shinn, Historical Dictionary of Ethiopia, p. 149. ^ Claimed by Chief of Staffs Tsadkan Gebre-Tensae. Shinn, Historical Dictionary of Ethiopia, p. 149. ^ Claimed by Major General Samora Yunis. Shinn, Historical Dictionary of Ethiopia, p. 149. ^ "Ethiopia: Number of war dead soldiers reportedly 123,000" (in Amharic). Wonchif. 2001-04-10. ^ Government of Eritrea - Government of Ethiopia Retrieved 9 July 2018. ^ a b Xan Rice, east Africa correspondent (31 October 2006). "Annan warns of another war between Ethiopia and Eritrea". London: Guardian. Retrieved 29 March 2017. ^ Winfield, Nicole (Associated Press) (13 May 2000). "UN hints at sanctions if Eritrea and Ethiopia do not end fighting". The Independent. Archived from the original on 8 October 2010. ^ "International commission: Eritrea triggered the border war with Ethiopia". BBC News. 2005-12-21. Retrieved 29 March 2017. ^ Andrew England (Associated Press). 500,000 flee as Ethiopian troops storm Eritrea, The Independent, 18 May 2000. ^ "Report of the Secretary-General on Ethiopia and Eritrea". United Nations. 2005. Annex I. Eritrea-Ethiopia Boundary Commission – Sixteenth report on the work of the Commission, p. 5 § 20. S/2005/142. Retrieved 29 March 2018. ^ Schemm, Paul (2018-06-05). "Ethiopia says it is ready to implement Eritrea peace deal and privatize parts of the economy". Washington Post. ISSN 0190-8286. Retrieved 2018-06-05. ^ a b c Briggs, Philip; Blatt, Brian (2009). Ethiopia. Bradt Guides (5, illustrated ed.). Bradt Travel Guides. pp. 28, 29. ISBN 1-84162-284-2. ^ a b c d e "Eritrea profile: A chronology of key events". BBC. 4 May 2016. Retrieved 29 March 2017. ^ Tesfai, Alemseged. "The Cause of the Eritrean–Ethiopian Border Conflict". Retrieved 2006-08-02. ^ Mussie, Tesfagiorgis G. (2010). "Eritrean colonial boundaries". Eritrea. Africa in Focus (illustrated ed.). ABC-CLIO. pp. 53–54. ISBN 1-59884-231-5. ^ Shapland, Greg (1997). Rivers of discord: international water disputes in the Middle East. C. Hurst & Co. p. 71. ISBN 1-85065-214-7. ^ Degefu, Gebre Tsadik (2003). The Nile: Historical, Legal and Developmental Perspectives (illustrated ed.). Trafford Publishing. pp. 94–99. ISBN 1-4120-0056-4. ^ a b Abbink 2003, p. 221,226. ^ a b Connell, Dan (2 October 2005). Woods, Emira (ed.). "Eritrea/Ethiopia War Looms". Foreign Policy in Focus. ^ Hans van der Splinter. "Border conflict with Ethiopia". eritrea.be. Retrieved 29 March 2017. ^ Dowden, Richard (2 June 2000). "There are no winners in this insane and destructive war". The Independent. Archived from the original on 12 December 2008. ^ BBC staff (6 June 1998). "World: Africa Eritrea: 'Ethiopia pursues total war'". BBC Monitoring service. ^ Eritrea Ethiopia Claims Commission. "PARTIAL AWARD Central Front - Ethiopia's Claim 2". "J. Aerial Bombardment of Mekele" Paragraphs 101–113. Archived from the original on 13 July 2014. ^ a b Biles, Peter (20 May 2000). "Ethiopia's push north". BBC. ^ IRIN. "Ethiopia-Eritrea: New peace efforts amid claims of civilian abuses". ReliefWeb. Retrieved 29 March 2017. ^ "HRW World Report 1999: Ethiopia: The Role of the International Community". Archived from the original on 14 November 2008. ^ Tareke, Gebru (2009). The Ethiopian Revolution: War in the Horn of Africa. New Haven: Yale University. p. 345. ISBN 978-0-300-14163-4. ^ BBC staff (1 March 1999). "Ethiopia declares victory". BBC. ^ CNN staff (27 February 1999). "Eritrea accepts peace deal after Ethiopian incursion". CNN. Retrieved 29 March 2017. ^ BBC staff (15 July 1999). "World: Africa Ethiopian-Eritrean war of words continues". BBC World Service. ^ Last, Alex (16 March 1999). "World: Africa Hundreds killed in Horn". BBC. ^ Laeke, Mariam Demassie (23 July 1999). "Touring the Ethiopian front". BBC. ^ Jenkins, Cathy (22 July 1999). "Eritrea's women fighters: A quarter of Eritrean soldiers are women". BBC. ^ Pearce, Justin (12 May 2000). "Diplomats fail to bridge the gap". BBC News. ^ a b BBC staff (23 May 2000). "Ethiopia says war nearly over". BBC. ^ Gilkes, Patrick (19 May 2000). "Ethiopia's war strategy". BBC. ^ Lortan, Fiona (2000). "The Ethiopia-Eritrea Conflict: A Fragile Peace". African Security Review. 9 (4). Archived from the original on 5 March 2012. 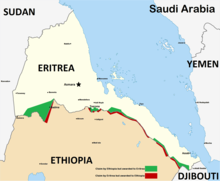 ^ "Ethiopia and Eritrea Border Conflict". London: Embassy of The Federal Democratic Republic of Ethiopia. Archived from the original on 7 March 2016. ^ "UN SC Resolution 1298". United Nations. 17 May 2000. S/RES/1298(2000). Retrieved 18 March 2017. ^ Hannan, Lucy (27 May 2000). "Stubborn Eritrea denies defeat but seeks peace". The Independent. Archived from the original on 15 February 2001. ^ Last, Alex (26 May 2000). "Eritrea's 'tactical retreat'". BBC. ^ Plaut, Martin; Gilkes, Patrick (31 Mar 1999). "Conflict in the Horn: Why Eritrea and Ethiopia are at War". ReliefWeb. Chatham House. ^ BBC staff (1 June 2000). "Ethiopia's victory statement". BBC world monitoring service. ^ Tran, Mark (25 May 2000). "Ethiopia declares victory over Eritrea". he Guardian Unlimited. ^ CNN staff (23 December 2000). "Eritrean, Ethiopian exchange of POWs begins". CNN. Archived from the original on 16 April 2009. ^ Fisher, Ian (23 August 1999). "Peace Deal May Be Near for Ethiopia and Eritrea". New York Times. ^ CNN staff and wire reporters (22 May 2000). "Eritrean independence celebrations muted as Ethiopian troops advance". CNN. Archived from the original on 18 June 2008. ^ a b Staff. Human Rights Developments, World report 2001 Human Rights Watch (2001). A Statistical Report of Eritrea's Casualties in the Eritrea–Ethiopia Border War (1998–2000) Archived 2007-12-25 at the Wayback Machine published by Awate Foundation Archived 2007-04-06 at the Wayback Machine, P.O. Box 580312, Elk Grove, CA, 95758-0006 U.S.A.
^ "After 70,000 deaths, Eritrea and Ethiopia prepare for war again". Timesonline.co.uk. December 8, 2005. Archived from the original on October 12, 2011. ^ "Ethiopia accuses Eritrea of instigating war". AlertNet, Reuters. 8 October 2007. Archived from the original on 12 December 2007. ^ "Ethiopia-Eritrea impasse could lead to new war - UN". Reuters.com. 2007-01-24. Archived from the original on 24 December 2007. ^ "PBS NewsHour Analysis – Ethiopia and Eritrea – Transcript". PBS. May 30, 2000. Archived from the original on 15 September 2013. 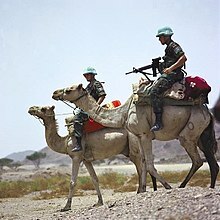 ^ "Ethiopia, Eritrea Run Risk of New War - UN Envoy". globalpolicy.org. AlertNet, Reuters. 2005-03-27. Retrieved 29 March 2017. ^ Peter Biles, Eritrean disaster looms as a million flee from rapidly advancing Ethiopian forces, The Independent, 20 May 2000. ^ "A critical look into the Ethiopian elections". Archived from the original on 2006-11-29. Retrieved 2007-02-19. ^ Natalie S. Klein Mass expulsion from Ethiopia: Report on the Deportation of Eritreans and Ethiopians of Eritrean origin from Ethiopia, June – August, 1998 "NOTE: This report is being reproduced, with the author's permission, by the Embassy of Eritrea, Washington DC, USA. The text is identical to the original. It has been reformatted and therefore pagination is not the same." — This website site is developed and maintained by Denden LLC and dehai.org. The site was initially developed by the Eritrean Media and Information Task Force (Badme Task Force), a volunteer group of Eritrean-Americans in the Washington Metropolitan Area. ^ "Eritrea expels over 800 Ethiopians home – official". Sudan Tribune. 2007-10-29. Retrieved 2008-01-06. ^ Tadesse, Zenbeworke. "The Ethiopian-Eritrean Conflict" (PDF). Calx Proclivia. pp. 109–110. Archived from the original (PDF) on 14 June 2007. Retrieved 29 March 2017. ^ Staff. Horn peace deal: Full text BBC, 11 December 2000. "Agreement between the Government of the State of Eritrea and the Government of the Federal Democratic Republic of Ethiopia"
^ a b c Zane, Damian. Ethiopia regrets Badme ruling, BBC, 3 April 2003. ^ a b "Eritrea–Ethiopia Boundary Commission website". Archived from the original on 23 October 2006. ^ Astill, James (2002-04-15). "Ethiopia and Eritrea claim border victory". London: The Guardian. Retrieved 2007-01-07. ^ Young, John (November 2007). Armed groups along the Ethiopia–Sudan–Eritrea frontier (PDF). Geneva: Small Arms Survey, Graduate Institute of International Studies. p. 32 (PDF 17). ISBN 2-8288-0087-3. ^ "Free rein for Eritrean opposition". BBC News. 23 May 2000. Retrieved 2007-11-26. ^ Eritrea–Ethiopia Boundary Commission (24 June 2002). "Decision regarding the "Request for interpretation, correction and consultation" Submitted by the Federal Democratic Republic of Ethiopia on 13 May 2002" (PDF). Archived from the original (PDF) on 24 February 2012. ^ "Jus Ad Bellum Ethiopia's Claims 1–8". Eritrea Ethiopia Claims Commission. December 19, 2005. p. 5. Archived from the original (PDF) on 1 December 2013. ^ Gray, Christine. "The Eritrea/Ethiopia Claims Commission Oversteps Its Boundaries: A Partial Award?". The European Journal of International Law. 17 (4). ^ Allo, Awol K. "Ethiopia offers an olive branch to Eritrea". www.aljazeera.com. Retrieved 2018-06-28. ^ "Ethiopia, Eritrea leaders to meet 'soon' in surprising thaw - NEWS 1130". NEWS 1130. 2018-06-28. Retrieved 2018-06-28. ^ "First commercial flight in 20 years leaves Ethiopia for Eritrea". First commercial flight in 20 years leaves Ethiopia for Eritrea (in Turkish). Retrieved 2018-07-19. ^ BBC staff (28 July 2011). "UN report accuses Eritrea of plotting to bomb AU summit". BBC. ^ Reuters (15 March 2012). "12 years after bloody war, Ethiopia attacks Eritrea". World news on msnbc.com. Archived from the original on 7 July 2012. Abbink, Jon (2003). "Badme and the Ethio-Eritrean Border: The challenge of demarcation in the Post-war period" (PDF). Africa: rivista trimestrale di studi e documentazione:. 58 (1–4): 219–231. Brothers at War: Making Sense of the Eritrean-Ethiopian War (Eastern African Series) by T. Negash, K. Tronvoll, Ohio University Press ISBN 0-8214-1372-4. Ethiopia Eritrea Conflict Archive: News and Article Archive Day to day coverage of war. Eritrea – Ethiopia Conflict Page This site is developed and maintained by Denden LLC and dehai.org. The site was initially developed by the Eritrean Media and Information Task Force (Badme Task Force), a volunteer group of Eritrean-Americans in the Washington Metropolitan Area. Tom Cooper & Jonathan Kyzer. II Ethiopian Eritrean War, 1998 – 2000 website of ACIG.ORG 2 September 2003. Details the use of air power during the war. Abbink, Jon. 'Law against reality? Contextualizing the Ethiopian-Eritrean border problem.' In: Andrea de Guttry, Harry Post & Gabriella Venturini, eds., The 1998–2000 War Between Eritrea and Ethiopia: An International Legal Perspective, pp. 141–158. The Hague: T.M.C. Asser Press – Cambridge: Cambridge University Press, 2009. Staff. Eritrea – Ethiopia Conflict Analysis Page This site is developed and maintained by Denden LLC and dehai.org. The site was initially developed by the Eritrean Media and Information Task Force (Badme Task Force), a volunteer group of Eritrean-Americans in the Washington Metropolitan Area. It includes documents from non-Eritrean sources as well as analysis by Eritreans. Demarcation Watch. A list of articles on the demarcation dispute. This site is developed and maintained by Denden LLC and dehai.org. The site was initially developed by the Eritrean Media and Information Task Force (Badme Task Force), a volunteer group of Eritrean-Americans in the Washington Metropolitan Area. Brothers at Arms – Eritrea. A news clip filmed by Journeyman Pictures during the war.